Lieberoth, A., & Trier-Knudsen, J. (2016). Psychological Effects of Fantasy Games on Their Players: A Discourse-Based Look at the Evidence. In A. Byers & F. Crocco (Eds. 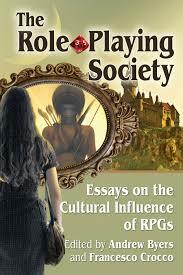 ), The Role-Playing Society: Essays on the Cultural Influence of RPGs (pp. 46–71). Jefferson, NC: McFarland. This chapter is a good discourse analysis on the psychological impacts of role-playing games and a summary of the rare empirical studies of the last 30 years. The author discards completely the “hard claims” of the 1980s who were saying that RPG leads to suicide, clinical diagnose, violence or crime. However, he is also very cautious with the studies of the 2000s that proselytize the positive effects of RPG. Indeed, there is almost no empirical evidence that RPG activities are especially effective compared to other social/intellectual activities. We need to stop building apologetic theories and, on the long term, keep gathering more empirical quantitative and qualitative data. Maybe we will read more in this forthcoming open-access article : Lieberoth, A., & Højgaard, J. Y. (forthcoming). Psychological effects of fantasy role-playing: a structured review of the empirical research. International Journal of Role-Playing. Found with ProQuest alert (MLA International Bibliography). 12 new references in bibliography (10 theses i didnt had: i immediately correct my Dissertations & Theses alert). Author : GS and univ. alerts created. Followed in Academia and RG.